Air pollution is a significant health, economic and environmental problem for the UK generally and in London specifically that requires concerted efforts from a variety of stakeholders to address effectively. In London alone, air pollution contributes to in excess of 9,400 premature deaths every year, and costs the health system between £1.4 and £3.7 billion per year, as well damaging buildings and biodiversity through the formation of pollutants into acid rain. Air pollution has received a lot of media attention in recent years, with sometimes conflicting messages and often very technical information. These web pages aim to draw together existing evidence and research on air pollution in London to demystify these messages and technical terms. 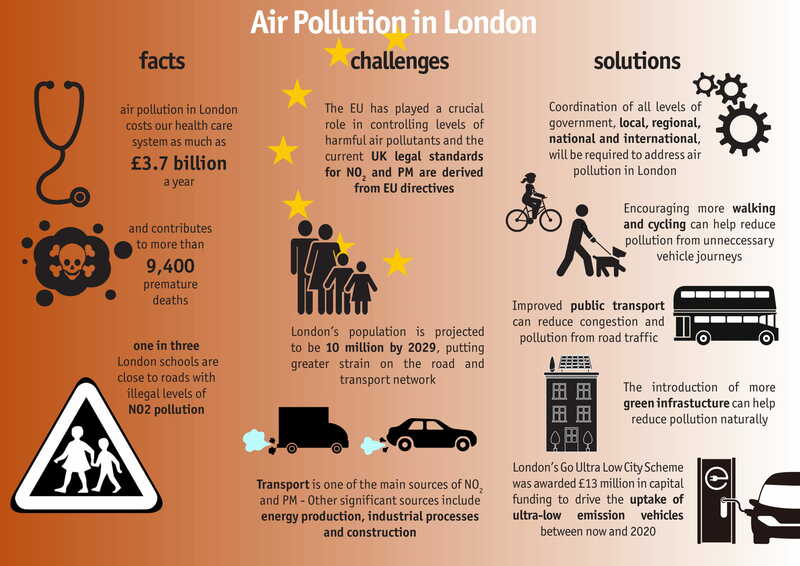 Our larger report gives details of current local, national, and international actions to prevent further, dangerous air pollution, while also highlighting the role of the various different stakeholders, including London boroughs, within this. It explains the terminology used, the health effects be experienced, the challenges facing policy makers and some potential solutions. We are also highlighting the importance of learning from previous mistakes, such as the policy to support diesel vehicles to reduce carbon emissions without considering the impacts this policy had on air quality. Any effort that addresses the air pollution challenge needs to be holistic in nature and assess the potential for unintended consequences.